FILE - A hostess holds a tray of sliced American beef at an event to celebrate the re-introduction of American beef imports to China, in Beijing, China. Even before U.S.-China trade tensions began escalating dramatically, foreign businesses who operate in China were warning about the impact tariffs could have. And now, according to a newly released joint survey from the American Chamber of Commerce in China and AmCham Shanghai, many are already feeling the pinch. 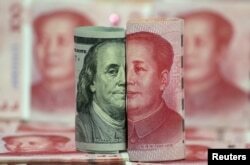 More than 60 percent say the initial $50 billion in tariffs rolled out by the United States and China are having a negative impact on business, increasing the demand of manufacturing and slowing demand for products. That number is expected to rise to nearly 75 percent if a second round of tariffs, an additional $200 billion in tariffs from Washington and another $60 billion from Beijing, goes ahead. The administration of President Donald Trump has threatened it could go ahead with $200 billion in tariffs and, if needed, $267 billion more after that. FILE - Shan Yuliang, salesperson at a cigarette and wine shop, poses with a carton of Marlboro cigarettes in Beijing, China, April 8, 2018. William Zarit, chairman of AmCham China said while there are expectations in Washington that an additional onslaught of tariffs could force Beijing to wave the white flag, it risks underestimating China’s capability to continue to meet fire with fire, he said. “It seems that American companies will be more harmed by the American tariffs than they will by the Chinese tariffs. I don’t think that this necessarily is a result that was expected,” Zarit said. President Trump argues that China is stealing jobs from the United States and not doing enough to address the huge trade deficit between the two economies. The tariffs are seen by proponents as a way of pressuring China to move away from its state-led economy and policies that force technology transfers. Zaritt said it remains to be seen whether some of the Trump administration’s tactics and tariffs will address big problems, such as Chinese protectionism, state capitalism and other things such as preferential loans and subsidies. He said one key approach that could go a long way to help ease tensions is for the focus to shift toward equal and reciprocal treatment. “The Chinese have acknowledged that as their economy is evolving away from an export driven/investment driven to a more consumption/domestic demand driven economy, that they really need to open their market. And so, the big question is why would you not do that if it is in your interest?” Zarit said. FILE - U.S. 100-dollar banknote featuring American founder Benjamin Franklin and a Chinese 100-yuan banknote featuring late Chinese chairman Mao Zedong are seen in this picture illustration. In Beijing, some have framed the trade tensions as an attempt by the United States to thwart China’s rise. Others, however, have suggested that instead of opening up markets and giving private enterprises more space, the opposite should happen. An article written by Wu Xiaoping, a veteran financier and columnist argues it is time for private enterprises to think about exiting the market. In the article, he argued China should move toward a large scale centralized private-public mixed economy. He also said the private economy shouldn’t expand blindly. “The private economy has accomplished its mission to help the public economy develop and it should gradually step aside,” he wrote in the article. The article has sparked a backlash online and even state media reports have criticized Wu’s views. The fact that the idea was able to circulate so widely before being heavily censored on Thursday is a signal that the government might be sending out a trial balloon. Others analysts argue the publication of the article could have been motivated by a fear for some that Beijing was preparing to make major concessions. Zhang Yifan, an associate economics’ professor at the Chinese University of Hong Kong, said despite the widespread criticism, the idea was worrisome. 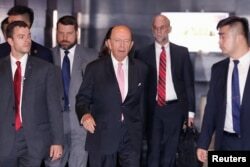 FILE - U.S. Commerce Secretary Wilbur Ross leaves a hotel ahead of trade talks with Chinese officials in Beijing, June 2, 2018. On Thursday, China’s Foreign Ministry confirmed that both Washington and Beijing are preparing for another possible round of talks and trade negotiations. A spokesman from the Foreign Ministry welcomed the invitation from Washington and the two were discussing details about the proposed talks. U.S. Treasury Secretary Steven Mnuchin invited his counterparts in China along with Vice Premier Liu He to attend the talks, which could happen in the coming weeks. The fact that higher ranking officials would attend the talks is being seen as a positive sign. The last round of talks were carried by lower-ranking officials.